My written poetry started in love letters in the late 1980's, my first published book Diary... was in 1991. Written expressions provide a comfort level for feelings of desire. My poems convey messages of love, pain, inspiration and passion as they arouse your senses. I share heart felt emotions with sincere respect to my personal experiences. My view on love and happiness inspires positive ideas and reveal painful realities. Often, we experience a feeling or desire that securely remain inside ourselves. We fear revealing our hearts and souls to others. The phobia of rejection masters our actions at some point in our lives. When I bean to share my intimate poetry, I discovered I can reach an inner-core of myself through the relationship of my written expressions and people who receive my messages. This discovery sparked radiance in my heart and motivation to continue creative expressions. My first spoken word performance was in hair salons in Philly, I was guaranteed an audience since the wait to get hair coifed was so long... I had poems written on small pieces of paper (nothing published)... I promised the salon clientele that I could create the perfect card for their unique relationship and include my poetry or create a poem just for them. My greeting card business was born. My next audience was in the back room on Saturdays at the Foundation Book Store, West Philadelphia, PA, early 1991. A few poets would meet and share, I was nervous in front of other poets, but I spoke and received positive encouragement, my passionate poetic style developed. Once my first book was released, I had to promote sales thus the invitations to collaborate with musicians, radio and TV opportunities were all blessings. I continue to share my gifts bestowed upon me from my Creator. I am only the vessel by which the messages flows. 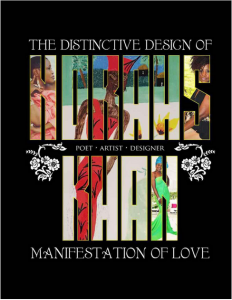 I invite you to experience and share this special presentation of my life's work - thus far: my poetry, art, designs, and letters. My distinctive style has been described as mood setting, soothing, exciting, peaceful, romantic, seductive, and inspiring. I claim it all.